Hi everyone! Welcome back to the series which looks in to my VHS tape collection. Last time, we looked at Hulk Hogan’s Real American. The Undertaker – His Gravest Matches: Made in 1993. Run time Of 2 hours. We open with a video package of tombstones and clips of The Undertaker in action. After this, we are treated to the duo of Mean Gene Okerlund and Bobby The Brain Heenan. Okerlund introduces us to the video tape, while Heenan hides behind him. Okerlund wonders why he’s so scared, and Heenan says he just doesn’t like the guy. Next up, we go to the graveyard with The Undertaker. He warns the viewer of his gravest matches, and says that the action in this tape bears a heavy price. A price which he will extract from every viewer in their darkest hour. A heavy price indeed. Jim Ross sells The Undertaker as an athlete, despite his look and slow, methodical approach. Bigelow seems laid back and isn’t worried about The Deadman. There’s a staredown, which is interrupted by Bam’s strikes. Taker no sells. Monsoon welcomes us to the video, so safe to say any commentary done by the team of Jr & Monsoon was added specifically. Taker countered with strikes of his own, and a choke. Taker whipped Bam off the ropes .. drop toe hold! I did not see that coming. An uppercut, followed by Old School. And then a missed Lariat, allowing Bam the advantage again. Bam drives Taker’s head in to the steel steps on the outside twice. Bearer in to motivate with the urn. Back in the ring, Bam drops a bunch of falling headbutts. A slam, followed by more headbutts. Taker does a slow sit up. Bam goes to the top and misses a falling headbutt from the top rope. Taker hit the jumping lariat. Bam starts leaving the ring area, but is cut off by rival Tatanka, who forces him back in to the ring. Chokeslam! RIP Bigelow. — More clips of Undertaker’s in-ring action, before moving on to the next match. A long wait before the match got underway. Staredown. Yoko opens with strikes, which Taker no sells. Yoko whips him to the ropes, but is countered by a DDT. Taker misses the first of many elbow drops in this collection. Yoko knocks him to the outside. Mr Fuji distracts, as Yoko rushes Taker in to the steel steps. Back in the ring, Yoko delivers a big banzai splash in the corner. A slam, followed by a leg drop. Taker sits up. A nice belly to belly by Yoko. Yoko gets frustrated for no reason, so he picks up his little basket and hits Undertaker with it. The match is called off as Yoko is disqualified, giving Taker the win. Yoko keeps attacking and sets him up for the Banzai drop. Taker sits up, hits the lariat, and only manages to chokeslam Yoko as he jumps slightly. Yoko rolls out and walks away, as Undertaker is declared the winner. Bit of a mismatch on paper. Repo looks scared long before his music hits. Repo gets a cheap shot at the start, but runs in to a chokehold. Big Boot by Taker. JR continues to sell his amazing athleticism and crisp technique. A slam on Repo, followed by missed elbow drop #2. Doesn’t stop him though, as he chokes Repo again. Repo tries everything, but keeps running in to Taker’s offense, before being thrown to the outside. Taker pushes him in to the ring post. Repo gets a hubcap and hits Taker clean in the face with it (ref distracted I think), which only infuriates him (as much as you can anger this version of The Deadman). Old School, followed by a Tombstone piledriver, ends this one-sided affair. Wippleman cuts a short promo in the ring. Taker comes out to a massive pop. His entrance is special this time, as he comes out hanging on to the back of a classic, English hearse containing a coffin. Heenan’s quick to point out the driver is “on the wrong side”. Kamala looks focused, but also a little worried. Kamala fails to get a cheap shot in, as Taker chokes. Kamala fails to splash him, as Taker goes Old School. He tries for Old School again, but Wippleman distracts, and he’s knocked to the outside. Kamala’s handlers provide another distraction for him to come to the outside and continue the offense. He puts Taker in the steps, before they get back in the ring. Kamala chops him down, but this leads to a chokeslam! He hits the lariat, before a Tombstone Piledriver attempt. Kamala’s handlers rush in to interfere, and Taker again .. wins by disqualification. Kamala keeps chopping and splashing. Taker is announced the winner amid the chaos. Kamala hits TWO top rope splashs on The Deadman .. but he sits up! Kamala is completely freaked out and runs away from the freak of nature. Undertaker stalks Kamala, as he runs for his life. — Back to Gene & Brain, Gene hopes we’ve enjoyed Undertaker’s gravest matches so far. Brain is again hiding behind Gene, as The Undertaker scares him that much. Some of the audience look perplexed during Shango’s entrance. Brief staredown, til Shango chokes Taker, who chokes right back. Taker whips him and gets the big boot. Old School, followed by a slam. Missed elbow drop #3! Shango knocks him to the outside. Shango goes to get him back in the ring, but Taker stuns his jaw off the top rope. A crazy dangerous spot next .. as Shango grabs his staff, and literally attacks him with a firework staff. A brief light of fireworks come shooting out of his staff, hitting Taker, and the referee didn’t notice somehow. The commentary team are flabbergasted to why the match is allowed to continue. Shango hit Taker with a steel chair as Bearer has the ref distracted. Knocks Taker in to the steps. Back in the ring, the end sequence begins with Shango slamming Taker to the mat. Sit up. Slam #2. Sit up. Slam #3. Sit up! Stomps, followed by three elbow drops. Sit up!! Taker somehow comes back from the offense, hits the lariat, and the chokeslam before pinning Shango for the three. — We get a brief Taker promo, with him saying all of his opponents will Rest .. In .. Peace. Razor is not intimidated in the slightest. Razor goes up to him and pats him on the back, which sends Taker in to a rage. He pummels on Razor, til he runs into a Ramon boot. Razor gets some offense in before Taker goes for the choke. Very rare, but Taker goes as far to rake the eyes of his opponent. They fall to the outside, and Taker shoves him to the steps. Razor’s head meets table as well, before they get back in. Taker slams, before missed elbow drop #4! They both trade blows in the middle of the ring, as JR puts Razor over. Taker goes for Old School, but Razor has a counter! And knocks him to the outside. Razor bangs Takers head off the steps twice, and then uses the steel chair twice. Referee seems to be letting it slide. Back in the ring, Taker gets Razor with the chokeslam, but he knows better and rolls out. He surprises Taker by pushing him in to the ring post. Razor slams him on the concrete, but The Deadman sits up. Razor legs it back to the ring and waits for his opponent; trying to get a 10-count win. Taker gets back in the ring, but Razor has a plan, utilizing the Abdominal Stretch. Monsoon says the hold is no good as it doesn’t work properly on larger opponents. JR points out that Razor’s use of the rope out of the ref’s sight is enough leverage. He releases it and tries a leg drop, but misses. Razor thumbs his eyes instead, and snapmares him in to a rear chin lock. Not sure when it happened, but it seems Razor’s bleeding from above his left eye. Taker escapes the chokehold and gets him with a lariat! Taker sets him up for the Tombstone, but Razor escapes it, and the ring. He heads to the back, as Taker stalks. Referee counts them both out, leaving this good match a draw. — A clip of The Undertaker coming out of a coffin during a segment with Kamala and Tatanka. Kamala gets so scared he escapes the ring and runs away through the crowd. Commentary put over The Berserker in this handicap match. Taker and he brawl in the beginning, til he chokes him. Berserker gets out of it and big boots to the face. Action on the floor, and Taker bangs Berserker’s head off the steps. Back in the ring.. Taker stalks and seems to, err .. uppercut Berserker’s leg from behind? Bit strange. Taker misses the lariat again. They spill to the outside, and again he gets his head banged off the steps twice, and hit with a steel chair as ref’s distracted. Back in the ring .. then back out again. Berserker’s head off the steps this time. Back in the ring .. missed elbow drop #5! And my word, they just keep knocking each other to the outside. Berserker slams Taker, then gets some cable and chokes him out. Steel chair again, three shots this time. Back in the ring .. and he ties Taker in the ropes. He gets some hits in, then charges at Taker, who gets out of it and launches him over the top to the outside. He goes to the outside and Berserker gets him in the steel steps again. Back in .. Berserker nails him hard with a piledriver, but Taker no sells. Another piledriver .. still a no sell! A third piledriver! Taker fails to sit up this time. Berserker tags Fuji in. He does a headbutt drop, then tags back out quickly. Berserker takes too long and Taker recovers, hitting him with a lariat. A Tombstone ensures him the pin. Fuiji goes after him, but gets a tombstone of his own. Probably one of the best parts of the video was the long segment of Paul Bearer and The Undertaker in their coffin workshop. 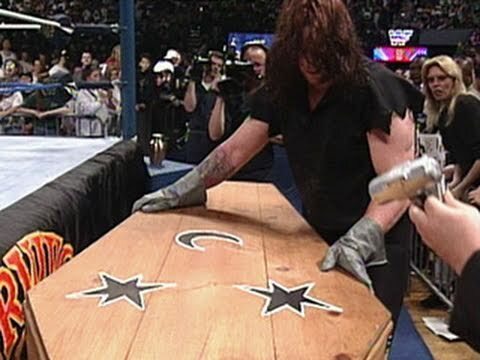 As Taker grafts away at Kamala’s tailor made coffin, Bearer explains how much work he’s put in to it, and at the Survivor Series, Undertaker will make sure Kamala loses their coffin match. I couldn’t stop grinning through it, as it’s segments like these which makes The Undertaker the legend we all know and love. Bearer brings out Kamala’s coffin, followed close by The Undertaker. Kamala is utterly petrified, I can’t remember a time when anyone looked as scared as Kamala does here. The match starts and Kamala runs away. Taker catches up with him and they brawl, before Taker takes him Old School. Taker clotheslines him down for a 2-count. Kamala finds some bravery and knocks him to the outside. The handlers provide a distraction so Kamala can bounce Taker’s head off the steps twice. He uses a steel chair on him. Kamala slams him three times, and Taker fails to sit up. Kamala keeps up the offense with three splashes. Bearer gets up on the ring apron, but one of the handlers knocks him off. The urn falls and one of the handlers grabs it. He gets in the ring so Kamala can use it, but a scuffle ensues and the urn drops to the mat. Taker gets hold of it and uses it on Kamala. He passes it back to Bearer. He pins Kamala .. and the referee counts 1-2-3. Huh? This is a coffin match. Commentators explain you “have to pin them first”, even though this was never explained before .. so likely a botch by all involved being covered up. Kamala is rolled in the coffin and Taker places the lid on. He gets some screws and a hammer, and starts nailing them (badly) in to the coffin lid. After five or six screws, he is announced the winner. Taker gets in the ring and poses, as Bearer walks by the camera saying “Ohhhh yeeesss!”. He takes Kamala away to be buried alive. Much like The Berserker match, Mountie does a couple of piledrivers which doesn’t affect Taker much. He wastes tons of time looking at his opponent, before Jimmy hands him a microphone. He tells the audience he’s great or something (can’t remember what exactly, I don’t think anyone cares either way), which gives Taker time to recover and hit him with a lariat. A tombstone ends another one-sided bout. RIP Mountie. Tons of jeers for Giant Gonzales, which works great for Undertaker’s face reactions. No Paul Bearer due to injury. Giant jumps him at the bell, but Taker dishes the offense back. Gonzales kicks him, whips to the buckle, and hits the double thrust strike. A giant chin lock from the big man, prompting the audience to get loud. Taker fights back, before falling to the outside. And instead of landing on his feet like usual, he fell bad on his side. And umm, Taker in to the steps again. After some brawling on the outside, it gets back in the ring. They exchange blows, til Mr. Hughes showed up to interfere, handing the win to The Undertaker by DQ. Loud crowd reaction despite the terrible match. This is for the WWF Championship. Flair goads Taker before the bell. A staredown don’t last long, as Flair trash talks. Taker doesn’t like it, so he pushes him so hard Flair flies across the ring. Flair goes after him but finds himself in a Military press slam. Flair rolls out to buy some time. Back in the ring, Flair rakes the eyes. His chops are no sold, so he begs Taker in the way he does. Taker whips him hard, and Flair does his super sell over the turnbuckle to the floor. Back in again, Taker misses the lariat. Flair distracts the referee so Mr. Perfect can get some cheap shots in. Flair keeps attacking, but Taker has yet to be knocked down by any of his offense. Flair back drops him, but Taker sits up! Flair tries a suplex over the ropes to the outside, but Taker just suplex him back in. Mr. Perfect gets on the apron and passes Flair some brass knuckles. While refs distracted, Flair punches him in the face with the knuckles, before getting rid of them. He puts Taker in the Figure Four, but Taker sits up and chokes him out of it, and in to a Chokeslam! Perfect pulls the referee out before the 3. Perfect attacks Taker in front of the referee, yet there is no DQ. Taker hit Flair with the lariat, but a steel chair shot forced the referee to make the DQ decision this time. Taker tombstoned Flair for his efforts; winning the match, but not the title. — Gene & Brain back to thank the viewer for watching. Brain calls The Undertaker “an oddball”. Gene says “hey Undertaker”, so Bobby looks over his shoulder and runs out of the shot. He keeps running back and forth through the screen, trying to get away from an invisible Undertaker, as Gene thanks the viewer for watching the collection. — The best part was the end. With the perception that you, the viewer, are in a grave, looking up at The Undertaker, he says that for watching his gravest matches you have paid the price. You were warned, therefore .. you must Rest In Peace! He grabs his shovel, implying you are to be buried alive. I’m a big Undertaker fan, and this collection was a lot more fun than Hulk Hogan’s Real American. Granted, some of the matches were similar, and many of the spots were repeated, but it goes to show how far wrestling’s evolved. The Undertaker was a simple character with a very limited movset .. but it was his aura, his technique, and good storytelling by others, which made his matches memorable. By today’s standards, most wouldn’t get over a 3-star rating (except maybe the Razor match), but the reactions would suggest otherwise. Undertaker’s Welcome & Ending promos to the viewer. Paul Bearer & Undertaker’s coffin workshop. The Razor Ramon match; til they were counted out. Kamala’s petrified look. An amazing job by this guy, I think his influence on Undertaker’s career is often understated. Heenan’s antics with Gene Okerlund between matches. The repeated shots of fans merchandise and custom posters/signs at ringside. Jim Ross & Gorilla Monsoon’s commentary. — Thanks for reading! I’m really enjoying this series so far, and I hope you are too. You may now Rest In Peace.